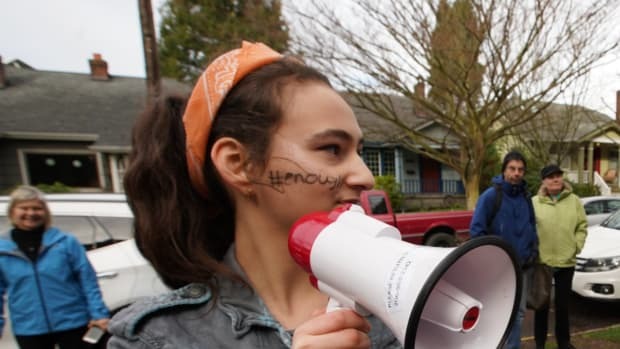 The youngest speaker at the Global Climate Action Summit in San Francisco this week is Jamie Margolin of Seattle, who founded the Zero Hour youth climate march this past July and led its flagship action in Washington, D.C. At 16, Margolin presents a youthful contrast to most of the GCAS leadership, like California Governor Jerry Brown (80); former New York City Mayor Michael Bloomberg (76); and China&apos;s top climate diplomat, Xie Zhenhua (68). Margolin was invited to the conference to represent her generation. She just didn&apos;t expect to be that generation&apos;s only voice. "There&apos;s no one else from Generation Z, the Parkland generation, onstage," Margolin laments—though she notes that she&apos;s attending with two Zero Hour colleagues, Arielle Martinez Cohen and Elsa Mengistu, both 17. 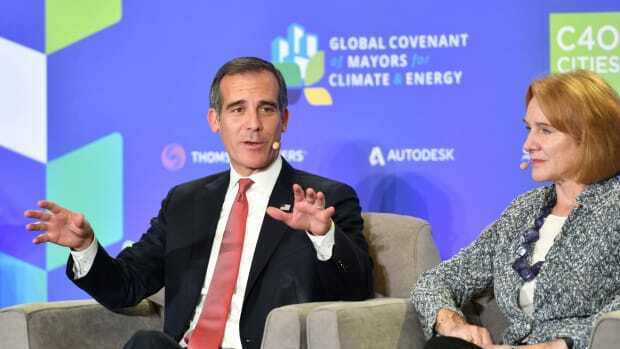 Given that young people are the ones who&apos;ll have to live with the future that&apos;s being administrated at summits like the GCAS, Margolin says it&apos;s crazy not to have a more sizable youth contingent at the table. 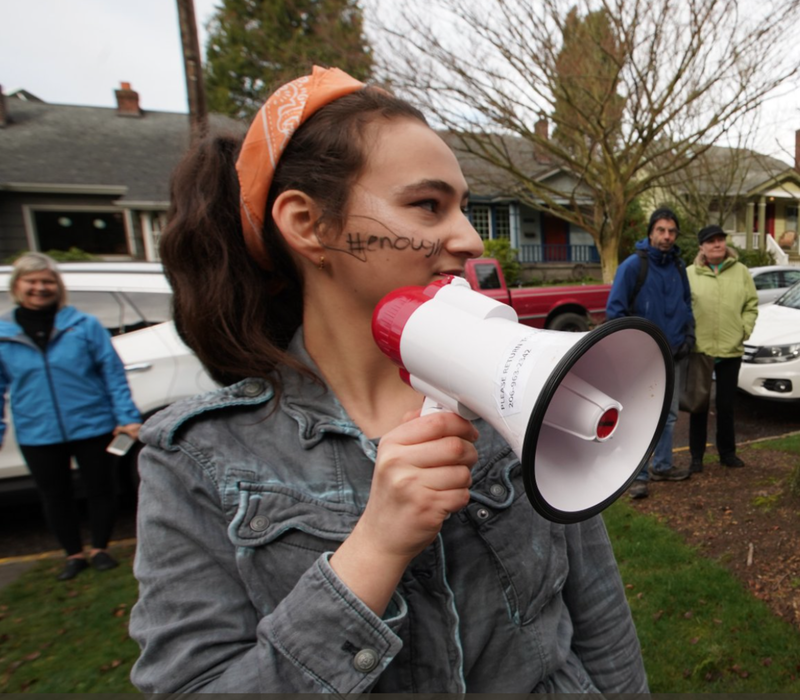 Since the climate march in July, Margolin has continued her activist work unabated, even as she begins her junior year of high school. Through her Zero Hour group, she&apos;s continuing to push her peers and political leaders to take a variety of radical actions on climate. She&apos;s also one of 13 plaintiffs suing Washington State for its failure to take adequate action on climate change. Margolin will appear in Friday morning&apos;s high-level plenary panel dedicated to "Building a More Just World Through Climate Action." Pacific Standard caught up with Margolin on Thursday to discuss radical vs. mainstream environmentalism, the art of balancing activism and homework, and why Generation Z might be skeptical about capitalism. 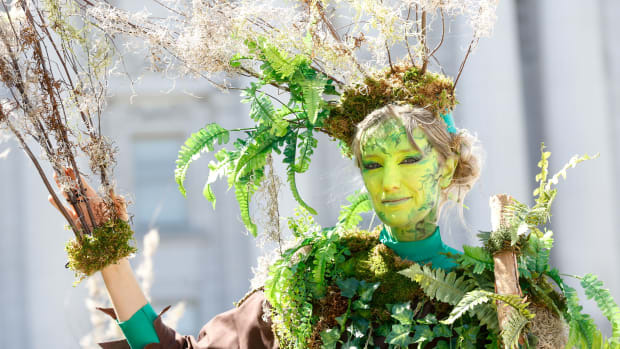 What&apos;s the message you&apos;re bringing to the GCAS? I&apos;m here to represent my generation. It&apos;s a very elitist space, with a lot of corporate people, a lot of money, a lot of power—and a lot of them make speeches saying, "Look how great of an environmentalist I am!" That is not what we&apos;re here for. The world is literally ending, you need to be thinking of the youth, putting the youth first, thinking about front-line communities, communities of color who are being impacted first, and stop this self-congratulation. 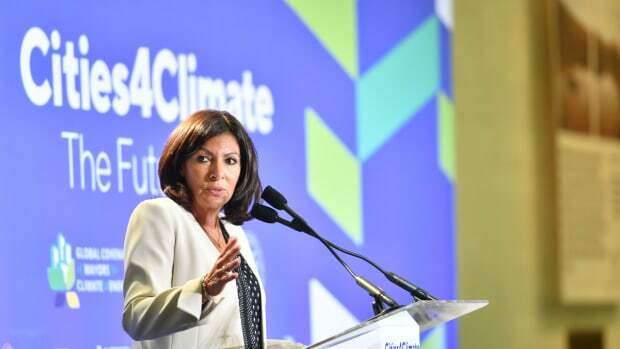 I&apos;m here to make sure that the GCAS leaders don&apos;t forget what they were put in place to do: to protect the next generation and take radical action. You&apos;re here to advocate, but you&apos;re also a speaker, and you&apos;ve told me that you need to avoid getting arrested this week. Are you avoiding protests? How are you navigating that? I remind myself that I&apos;m here to represent the youth. It&apos;s in the best interest of what I&apos;m trying to do to not start anything crazy. I was fortunate enough to get this platform to speak at this major event, so I&apos;ve just kind of been reminding myself, even though it&apos;s tempting—"Oh, I see the protests, and it looks exciting." I tell myself, there are enough people doing that; I can best serve people by speaking in here. I&apos;m just here to remind the older people why they should be fighting. It&apos;s easy to forget if you get sucked into that corporate world, and it doesn&apos;t make you a bad person, but you get sucked into the glamour and the power and the dynamics of the politics, and it&apos;s easy to lose sight. As the youngest speaker here at a high-level panel, I&apos;m going to behave myself. So you&apos;re comfortable navigating a variety of tactics? Yes, I always find myself in a navigating role. I&apos;m mixed-race; my dad&apos;s white, my mom&apos;s Colombian. I&apos;m like a cultural chameleon in that when I&apos;m with my white family I blend, when I&apos;m with my Latino family I blend, no one assumes I&apos;m not white or Latina—so I just have this weird like chameleon-esque way of existing. And I use that, use my privilege, because passing as white is a privilege, and even being here is a privilege, so I&apos;m using that to fight for what I believe in. You can be at home in grassroots and also among the more managerial class. Yes! My home is in the grassroots activist community, though. That&apos;s who I am, that&apos;s where I feel safe. You talk about organizing the economy in different ways; are you and some of your activist peers explicitly skeptical of capitalism itself? We are skeptical, and, in fact, we&apos;re against the idea that everything&apos;s for sale, that everything&apos;s a commodity. This is what we talk about in our platform, and it can be easily misinterpreted as "all the kids are commie now," but what we&apos;re talking about is the systems: You can&apos;t just slap a solar panel on this issue and say "done." You can&apos;t solve a problem with the same thinking that caused it. So where the environmentalist community splits is [between] the mainstream, who work in the same traditionally capitalist way of thinking—we just change industry from this [oil] to this [solar]—versus the grassroots people protesting outside, who say, "These systems of oppression, there&apos;s something deeper here." 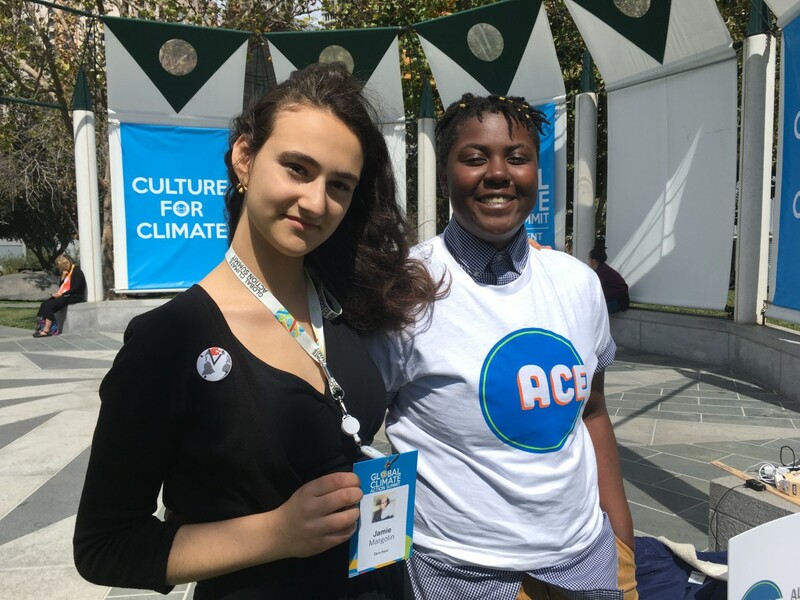 Jamie Margolin (left) with Vic Barrett, a fellow plaintiff suing the government over climate change, outside the Global Climate Action Summit in San Francisco this week. I am still figuring out my political alignment; I used to be a lot more centrist, but now I&apos;ve moved a little to the left. I don&apos;t know exactly where I stand. But whenever I listen, I pay special attention to the most marginalized voices in the room, often the darkest people in the room. It was funny, we were having a conversation recently, and everyone who said "capitalism is a system of oppression" was an immigrant or a person of color, and the people who were like "no, it&apos;s fine" were the white people in the room who were benefiting from it. We&apos;re not here to start the communist revolution. 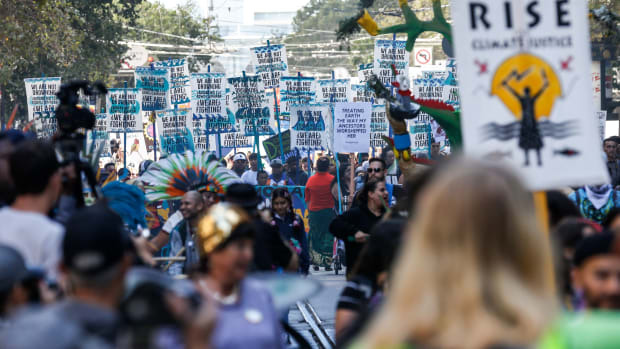 We&apos;re here to say that not everything is for sale, and that the GCAS leaders need to listen to indigenous people, people of color, low-income communities, and immigrants, who have been paying the worst price for the climate crisis and have been victims of these systems. You&apos;re missing classes to be here, right? What classes? Some classes I&apos;m glad to be missing. I&apos;m glad to be missing chemistry. I&apos;m glad to be missing math. I&apos;m not glad to be missing [Advanced Placement] studio art. And A.P. U.S. government and politics, I don&apos;t know how to feel about that because it&apos;s hella Euro-centric. ... And obviously the teacher is conscious, and I&apos;m that "but actually" kid in the class. I have some teachers who go off textbooks, and textbooks whitewash things. Are your parents on board with your activism? My parents are fully on board! Sometimes my mom gets annoyed. She says, "Do your homework more." She asks me what I&apos;m doing, and I say homework, but really I&apos;m checking my email because I tend to prioritize activism over school. It&apos;s kind of bad, but it&apos;s like, I don&apos;t know, the world&apos;s ending; what is this algebra homework going to do to help it? I&apos;m not failing school! I do my homework, I&apos;m fine.